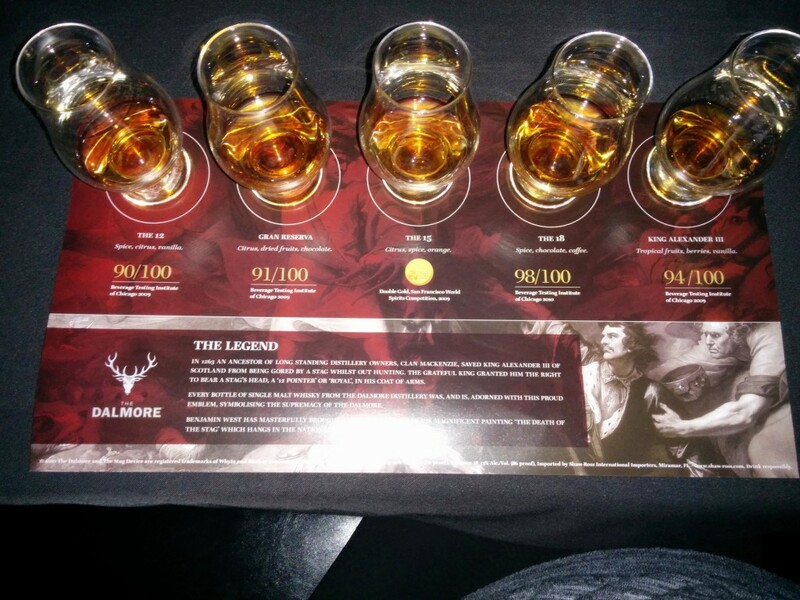 The plan was to introduce each dram, taste it straight then try the offered food pairing. With one ounce pours, this will require some restraint, and since the food was set-up as a buffet, a little more exercise than I’d planned – but it worked out okay. I’m of two minds on the provided mat; while I like having reference material, I don’t like being told what one should perceive on the nose and or palette. I like to judge a taste completely blind so I don’t look the flavors mentioned in the descriptions as I make my notes. A nice medium gold, and a mild nose of citrus honey and wood. The taste is soft, with a little burn that is a slightly disturbing counterpoint to almost floral tones. There is a whisper of citrus, but it’s gone as soon as you perceive it. It wants to be complex, but it’s just not there, the few different notes are disparate and when the get close they are more likely to combat one another instead of layering harmoniously. 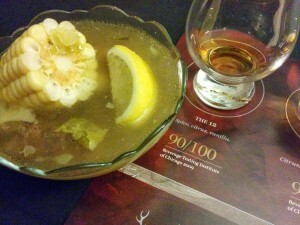 This was served with a Beef Cocino, and the fatty broth and rich flavors brought out the honey notes and otherwise complemented the dram nicely. 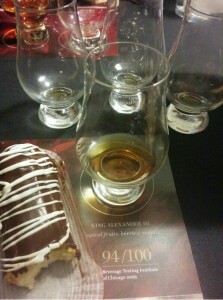 This was a nice start, but I found it a short and simple dram, gone almost before you are finished tasting it. This is a deeper gold, with thick legs. The nose is still sweet, with notes of apples, oranges and honey in the background – odd that for all that wood it’s finished in; I don’t pick up any of it on the nose. It is softer than the 12, more fruit than wood, but I lose the sweetness I liked in the 12 and on the nose of this one. Overall more harmonious that the 12, but not my favorite. 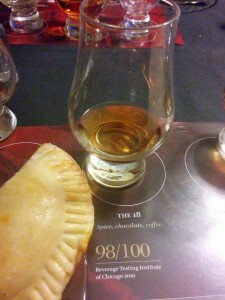 This was paired with a “aussie pie” which is a beef pasty – this dram wants something lighter, with more layers of flavors, maybe a chicken Florentine, or stuffed fish. I don’t think you can get that kind of tonal uniformity without creating it. I’m sure using the similar barrels in all expressions helps, but still, I’d be curious what these look like straight out of the barrel, or rather barrels. The nose is like oatmeal, a little nut and spice mixed with the grain, there may be wood in the background, but I’m not picking up much. This is the first layered flavor I’ve had tonight, unfortunately the second layer is burn. This starts of soft and sweet – a little dried fruit, and little vanilla . . and then your mouth is full of moonshine for a moment. Once that passes you get a beautiful finish of spice and nutshells that linger in the mouth like chicory coffee. 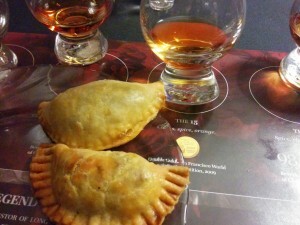 Food – a duck empanada was offered – suppresses that fiery middle layer and turns this into something I can drink all night. 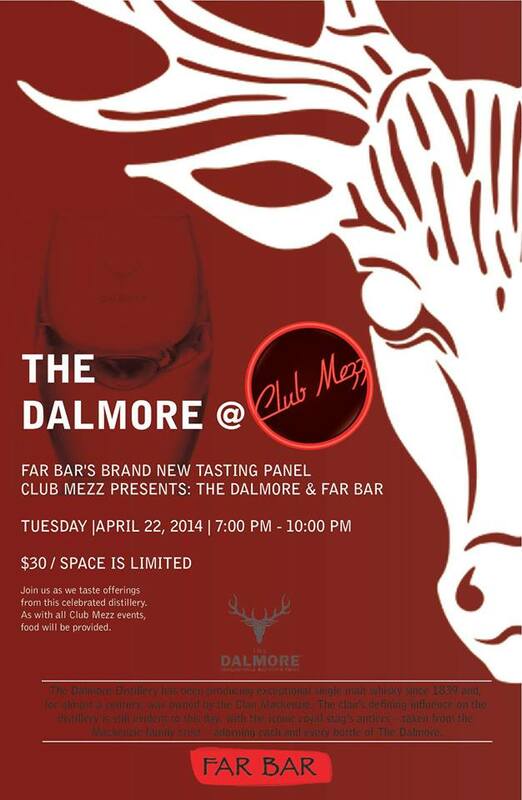 “The Dalmore Cigar Malt Reserve benefits from a judicious selection of aged stocks drawn from casks of three types: American white oak ex-bourbon casks, 30 year old Matusalem oloroso sherry butts and premier cru Cabernet Sauvignon wine barriques. This is a darker gold than the others, almost a mahogany. The nose promised me notes of caramel, chocolate and peaches. 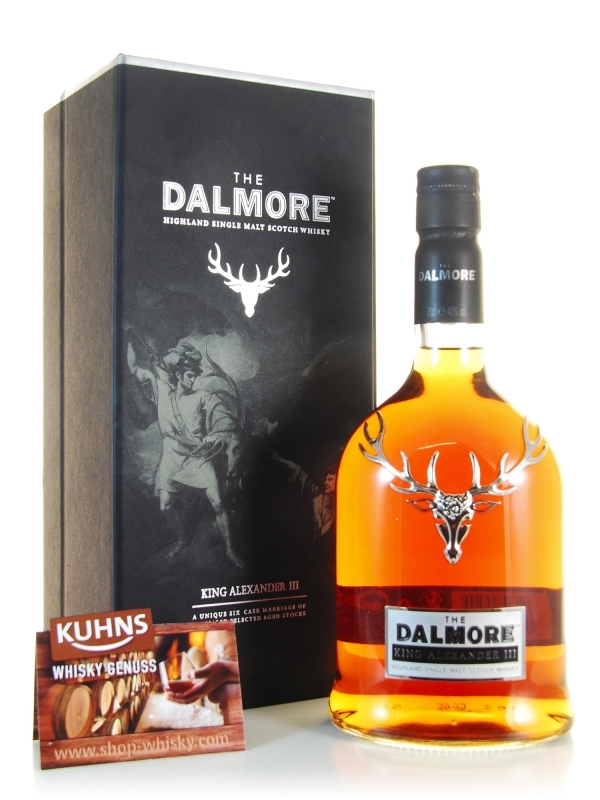 And the taste is just what I like: smoky without smoke, fruity without sweetness, caramel notes lingering on the mouth, a rich and smooth melody that hums a while after finishing the taste. Curse the Los Angeles legislation, but now that it was mentioned to go with a cigar, I want one. It’s funny, I got quite a bit of burn from the 43% 18-year, but this, at 44%, had almost none. 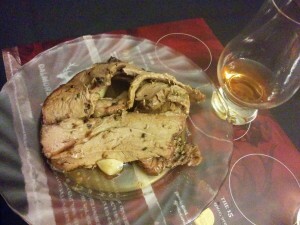 The roasted lamb is very nice, but it’s not the right thing for this dram – I’d save this for dessert – something sweet and equally rich. This was the crown jewel of the night, two people at my table said they were here just for this dram, and hinted that one can not get it in the states. The expression spends time in six different woods . . this should be a soft and complex expression . . .
Or not. The color seems flat and next to the others – I’m not sure what bottle they used for the promotional image – maybe it’s the full bottle, or the black background – but in this glass it looked pale. The nose has the similar sweetness as the others at the core, but highlighted by grass and grain with whispers of berries and cream. The taste is almost not there. I took a moment to clear my palette and start again with the nose, but the taste is very faint . . soft and gentle, very easy to drink straight, but not very complicated. It reminds me of an Irish with the soft green notes. 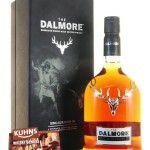 It’s a fine dram, but I don’t think I’d pay $300 for the bottle. 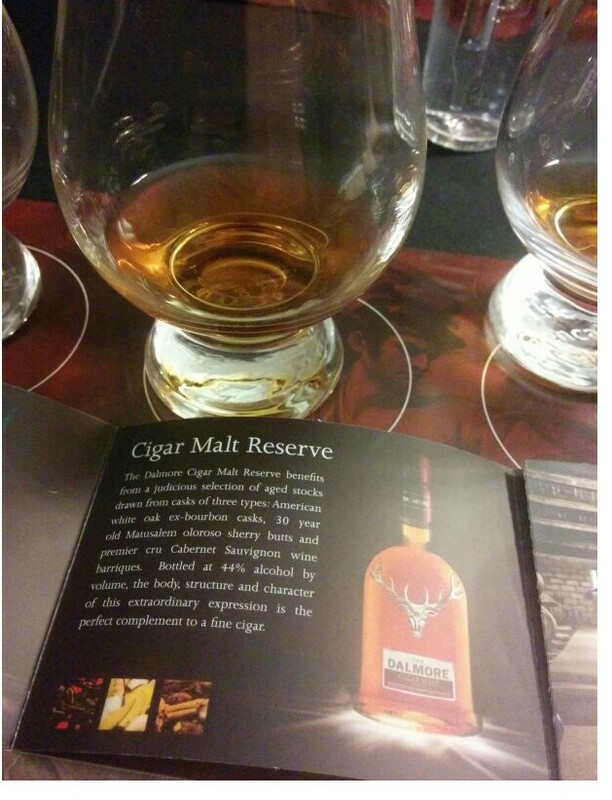 Pass the Cigar Malt back here, please. Oh yes, it was paired with a very good éclair, iced in chocolate and filled with pastry cream; a delicious end to the dinner, but far too rich for this soft, whispery expression. I ended the evening talking whiskey and barrel-aged beers with the host, and pouring myself another dram of the Cigar Malt . . really, this was the standout dram. I may have to invest in a bottle and get together with some smokers and see if and how it enhances that experience. This entry was posted in Events, Highland, Misc. Events, Regions. Bookmark the permalink.